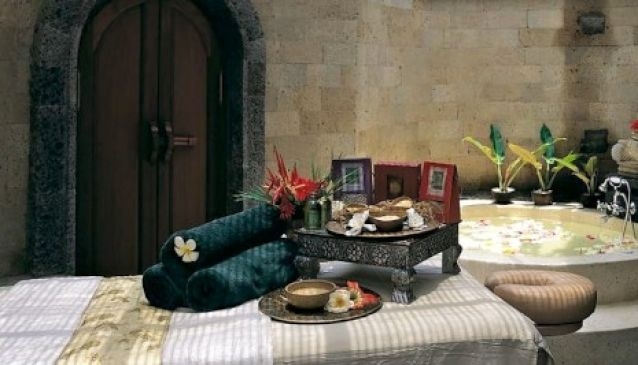 The Health and Well-being programme at Bagus Jati Spa is totally aimed at the individual guest. Learn to feel fit, eat healthier, or simply unwind and reduce stress. For those interested in food planning or weight management, healthy cooking classes are available. Foot Relaxing Massage - 45 Minutes - A combination of ancient Indonesian and Chinese acupressure techniques to relax your feet and improve blood circulation. Javanese Massage - 60 Minutes $80 - Using a secret blend of Indonesian herbal oils inspired by Royal Court recipe, a Javanese deep relaxing massage is highly effective to soothe and relax fatigued nerves and muscles. Balinese Massage - 60 Minutes $80 - traditional village massage, starting with muscle warm up without oil to stimulate blood circulation from the feet up. Barefoot Shiatsu - 60 Minutes US$80 - A modern adaptation of an ancient Eastern healing technique, powerful and deep treatment that unblocks muscles and meridians. See more. Jati Organic Indulgence - 180 Minutes $255 - Body massage + Organic Hair Treatment + Organic Facial. Jati Restoration Combination A - $120 Minutes - Body massage + Organic Facial. See more.